The easiest way to reach Waterford is by ferry, with Rosslare harbour only 75kms away, little more than an hour by road. Choose Irish Ferries to Ireland and a three-night St Patrick’s weekend break at the city’s Tower Hotel from just £164 per person based on two people travelling by ferry from Pembroke to Rosslare. The package includes a ‘full Irish’ breakfast each morning and return crossings for the car on the Isle of Inishmore ferry. 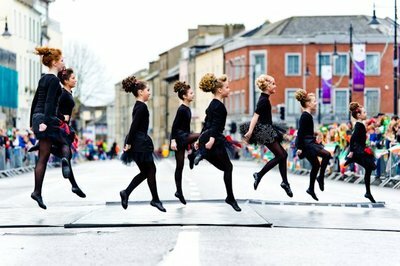 Up to 50,000 people are expected to watch Waterford’s parade on 17 March, with colourful floats created by local groups, plus marching bands and drummers. Home to the Irish tricolour, free flags will be handed out and there’s free green, white and orange face-painting for the young at heart. After the parade, there’ll be live music in John Roberts Square and plenty of spin-off celebrations in bars around the city. The three-star Tower Hotel is in the city’s heart, overlooking the marina, with free parking – ideal for self-drive guests – and a leisure centre with 20 metre pool, a gym, plus Jacuzzi, sauna and steam room in the spa. The hotel’s riverside Adelphi bar, the bistro and the Lara restaurant are all popular with locals as well as visitors. Waterford’s attractions – apart from its lovely setting on the River Suir – include 12th century Dungarvan Castle and the Waterford Crystal factory while pretty villages and Blue Flag beaches are only 15 minutes’ drive away.